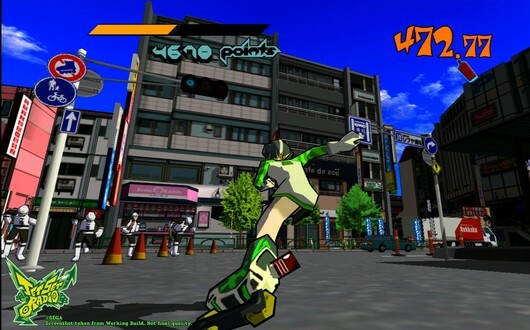 To many fans’ delight, Sega announced a while back that Jet Set Radio would be getting a release as an HD upgrade on Playstation Network, Xbox Live Arcade and other various versions. I was also exstatic to hear the news. I was a huge fan of the Dreamcast, but I never had a chance to play the original game (then titled Jet Grind Radio) beyond a few minutes. It’s been over 10 years since the original release, so one might worry that the game doesn’t hold up today. While Jet Set Radio HD is not a redesign outside of a slight camera adjustment, being able to play the game in 720p is a great compliment to the classic gameplay and style. I played the Playstation 3 version for this review. 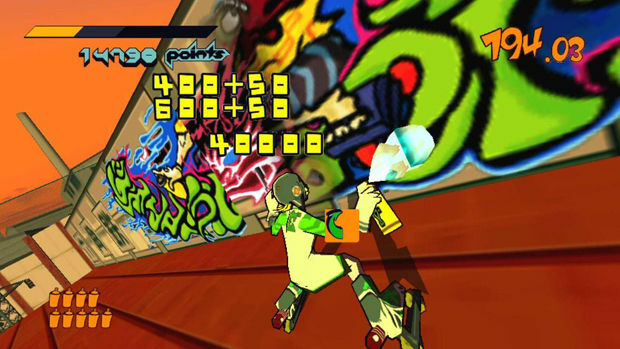 For those not in-the-know, Jet Set Radio is a game based entirely on the concept of spraying graffitti on rollerblades. You start off as a character named Beat, and slowly throughout the game you will come across new characters whom you must compete against in a variety of graffiti-spraying competitions to get them to join your group. There are a number of different groups, and they act sort of like graffiti-gangs; each group has territory that they ‘tag’ and claim as their own. Throughout the game you’ll be riding through different parts of the city to reclaim your turf with your spray paint. At some point, things become noticeably amiss, as it is apparent that a real gang called the Rokkaku Group is plotting behind the scenes, and your gang (called ‘GG,’ short for Graffiti Gang) must get to the bottom of it. Most of the story sequences come by way of a radio broadcast from the groovy Professor K, who hosts an underground pirate radio station. Professor K is one cool cat, with his stacks of speakers and pulsating hair, and in fact many of the members who join your gang are the epitome hip. Jet Set Radio is a very stylish game, and with sharper visuals, quite a pretty one at that. Suffice it to say, it’s pretty much unlike anything I’ve played before. A chunk of the game’s hipster mojo comes from the music. There’s quite a bit of original music, created from the groove mastermind Hideki Naganuma. His songs are catchy and the beats undeniably groove-worthy. They are perfect for setting the mood for acts of vandalism and grinding like a pro. Occasionally, other bands grace the game’s soundtrack. The ones that I noticed were Rob Zombie and Jurassic 5, which were a nice surprise. If you like cool beats and hip music, then your ears will be in for a treat. Only on occasion did I notice a really repetitive song, but in that rare occasion, the song changed shortly after anyway. Jet Set Radio is a real challenge. By that I mean…consider putting some padding on your controller. It starts out simply enough, but by the time I started to get a grip on the controls, the game didn’t hold back in punishing me, pushing my idea of challenge. Eventually though, with patience and renewed motivation, I was able to beat the hardest of levels by learning the best routes in the city. In the second half of the main mission, I was tasked with tagging building tops, high up walls, and sewers, all the while 70’s styled mustach-men chased me with knifes and helicopters shot missles on sight, and adhering to a sometimes strict time limit. Whew… this game definitely pulls out the stops. Some of the hardest parts in the game were actually situations where you have to tag the backs of other skaters a set number of times. I had to replay those levels many times, but eventually found out that there are certain spots in the level where you can really nail it. Overall the game leans a bit on the hard side, but it isn’t impossible. 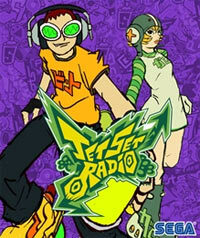 I assume some gamers who are used to the pampering of modern games will be unable to handle Jet Set Radio. I happen to be one of the few who has a sick sense of enjoyment when a game is just slightly impossible. The graphics in the game look very crisp and still hold up when upgraded to 720p. While it’s pretty obvious that the game has aged since then, the art style is quite pretty and stands out even today. Jet Set Radio is one of the first games to really showcase the beauty of cell-shaded graphics, and I can honestly say that while the models do look a little bit outdated, the style holds its appeal even now. The game as a whole has the vibe of an anime, or a comic (manga-style, of course). There are some noticeable problems, though. There is still slowdown, which shouldn’t be a problem considering the system it’s running on (Playstation 3). Also, occasionally the game will have a slight pause when either the music switches or a scene has to be loaded. These issues are minor though, and won’t really detract from the experience too much. Getting into the complaints I have with the game, I have to talk about the camera and controls a little bit. While I’ve read that Sega supposedly upgraded the camera system for this new release, there are still noticeable problems. Often times the camera will get hung-up on corners, or even in one particular spot, you are tasked with landing on a platform to complete a competition but you can’t even see it. Thankfully, that happens only once in the game, and it’s really not too much of a bother. But mix the camera trouble with finicky controls, and sometimes the game can be frustrating. It is very easy to miss a rail when landing, or run into a wall, or completely miss a passage, and on occasion the camera will twist and it feels like the game’s controls were the cause. Part of the reason also is that the controls are a bit clunky, but in some ways this control scheme is meant to limit you. If you were really riding on rollerblades at full speed, it would be hard to do a sharp turn or land perfectly on a rail, and the game mimics this difficulty. Sometimes the game is just downright frustrating. Conversely, though, I found that I just needed to replay a level a second or third time to understand the layout better, and also switching characters to find the best fit helped me to progress. At first I couldn’t really tell the difference between all the characters, but as you get to the harder levels you will notice the nuances of each one. My favorite character was Garam; he had power, he was fast, and it didn’t seem like he took very long to paint big areas. I’m sure other players will find a particular character that suits them well. Despite the problems in camera and clunky controls that still remain, Jet Set Radio is still a game that shouldn’t be missed, especially by those who like Sega’s signature style of speed, fun, and replay value. Trophies have been added to the game, and an online leaderboard is available for those who love comparing scores. You can finish the main game without getting all of the extra characters, so there is still plenty to do once you beat the main storyline mode. And honestly, it will take a while to master all the levels of this game. It’s true that Sega could have redesigned the game and sold it for a higher price, but I’m happy with being able to play the game in it’s original state, with sharper visuals and at a low price. After playing Jet Set Radio, I’m now convinced that a sequel built from the ground up in HD and with expanded features would be amazing.